Big changes are being planned for Ho-Chunk Gaming – Madison. 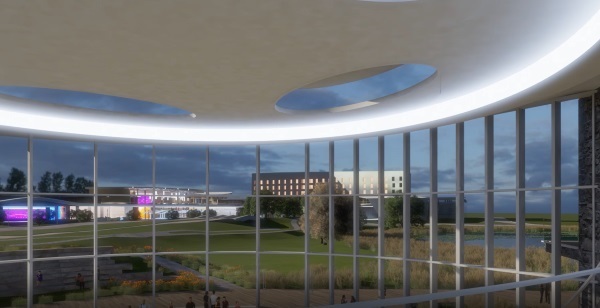 At this point, they are just plans, but if everything is approved, the facility will add a new hotel, a Heritage Center, two 1,000 space parking ramps, and conference space that doubles as an entertainment area. There are several steps that must be taken before anything can be approved. The first step is currently being pursued, which is changing the zoning code for the area around the casino to allow businesses to be developed. Ho-Chunk officials are approaching the city Urban Design Commission (UDC) for consideration for the land surrounding the casino to be zoned as commercial. “The casino is on trust land, but the rest on fee simple. We want to make it commercial zoning so that we can develop it,” Brown said. During the zoning process, no definite building plans need to be introduced. No specifications need to be introduced. In the early stages of the zoning approval process, more general designs by the architect are submitted. Once the GDP is approved by the City, Ho-Chunk Gaming – Madison will be required to obtain a Site Implementation Plan (SIP) and that will require more detailed plans – construction documents. The date for that requirement hasn’t been determined, taking one step at a time. Another development consideration is the Yahara Hills Golf Course, which involves changing the frontage road at Highway AB. It is an integral component of the changes. Both parts, the city, and the Ho-Chunk Nation are in favor of the change, Brown said. The changes will make it easier to access the Ho-Chunk Gaming – Madison complex. “The City conducted what they called the Yahara Hills Neighborhood Plan, and this was a study for the commercial, residential and green space development of the acreage north of Ho-Chunk Gaming - Madison. Its relevance is that our planned development is a part of that study,” Brown said. The proposed changes include a new hotel, a Heritage Center, two 1,000 space parking ramps, conference space that doubles as an entertainment area. Plans are to expand and remodel the present casino. The renovated facility would have 145,000 square feet with a two-story gaming area. There would be a walkable gaming rooftop, expanded food court, and an attractive water feature. The proposed 100,000 square foot hotel would provide between 150-250 rooms. The building also will host a 30,000 square-foot spa, a 6,000 square-foot 150 seat restaurant, and a 1,000 parking garage. The Heritage Center would be an independent 33,000 square foot building. It would not be just a museum for Ho-Chunk artifacts, but instead, a learning center that will allow visitors to learn the history of the people and the culture while being as much “hands-on” as possible. Brown anticipates many school groups coming to tour the Heritage Center for educational purposes. He envisions tour guides to explain Ho-Chunk life in the past and present to visitors. He foresees the Heritage Center becoming an educational destination for people from around the world. They have talked to officials at the Wisconsin Department of Tourism and they believe the center would be an important addition to promote tourism in the area and the state. “Visitors to Dane County spend $1.25 billion in 2017. We’re hoping to get a bigger piece of the pie,” Brown said. It’s important for people to know the long, rich history of Ho-Chunk people in the area. “There are more mounds around the Madison area that anywhere in the state and around the world,” Brown said. The Heritage Center would not be a substitute for any Ho-Chunk museum planned for elsewhere in the state, but instead work in conjunction and cooperatively with each other, he said. Brown is excited about a “green space” for visitors to wander and gather between the Heritage Center and the Entertainment/Conference Center. A pond with walking trails throughout the area would provide a place for people to gather, relax and enjoy nature in the outdoors. The Great Circle just outside the Entertainment/Conference Center would be a flexible outdoor space where events such as outdoor concerts could be held. An outdoor bar could be available to provide refreshments to event participants. When constructing the facilities, there would be a strong emphasis on renewable energy, such as solar panels. Plans are for a “photovoltaic screen wall.” They have already drilled for geothermal heat and that is a strong possibility for the structures. Brown said it has been a hard, long journey to build a relationship with the City of Madison. Years ago, they twice attempted getting a liquor license and failed both times. But the casino representatives have been working at developing a closer and more agreeable relationship with Madison. Missy Tracy, the Municipal Relations Coordinator has had a five-year courtship with the city. Madison can’t grow more out to the west because that area has become saturated and full. The only option is to the east, where Ho-Chunk Gaming – Madison casino currently resides. There’s an excitement in Madison about the Ho-Chunk connection, he said. City officials have learned about inclusion and they want to become more familiar, tolerant, and understanding of the Ho-Chunk people.